Our everyday curriculum enhances your child’s cognitive, social and emotional, and motor development daily. However, at Lakeside, we also offer enrichment programs. These programs are at an extra cost to families. Below are the enrichment programs offered at Lakeside. Please talk to the Administration if you are interested in your child participating in any of these programs. Instructors are approved by the State of Missouri Family Registry through a background check. Programs are held at various times throughout the year. Enrollment information will be posted at Lakeside. Soccer Shots have been professionally designed and are led by trained Soccer Shots instructors. The primary objective of each session is to creatively introduce your child to the sport of soccer. By enrolling your child in Soccer Shots, you can expect increased physical development through fun fitness activities, and an introduction to group and team concepts. Character development, physical skills, and fun are guaranteed in the program! The Stretch-N-Grow program is designed to promote exercise and wellness for pre-school and early elementary-aged children. 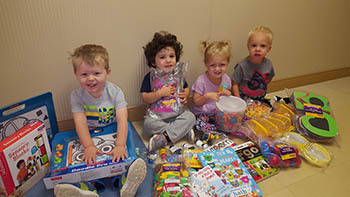 Stretch-N-Grow stars participate in weekly sessions, which include exercise, activities, and discussions on health and related issues such as nutrition, hygiene, and safety. Stars have lots of fun while they learn to enjoy exercise and build good habits. The mission of Computer Bryte Kids is to introduce children of all ages to technology as a meaningful tool for learning, communication, and creative expression. Computer Bryte Kids is dedicated to offering a variety of fun and unique experiences to provide children with the confidence and skills they will need to succeed in the digital future. Children become better thinkers, learners, creators, and doers. Pollitos pre-school Spanish program focuses on repetition and imitation of basic Spanish language. This fun, energetic Spanish class is filled with lots of movement in songs, games, instruments, puppet play, storytelling, and more! Children will sing songs about numbers, colors, animals, body parts, and songs of the season. Kinderdance is a dance class taught by Mrs. Molly, Kinderdance franchise owner. The dance class explores all different types of dance and movement. 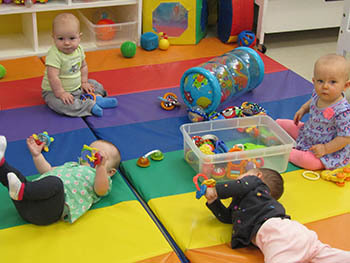 Large motor skills, balance, listening skills, rhythm, and more are taught through this class. Children perform at local high school annually in their dance recital.